From light and delicate to lush and unctuous, this dry European white has been gaining in popularity recently as a lively yet smoothly textured option behind such favorites as Chardonnay and Sauvignon Blanc. 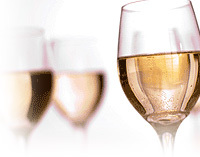 Although the intensity of flavors will vary depending on where it is produced, Pinot Gris can offer a range of fruit flavors including melon, peach, apricot, and pear. Typically quite floral and expressive, other trademarks are mild baking spice aromatics, subtle minerality, and a creamy lanolin-like texture. Pinot Gris is generally not oaked.